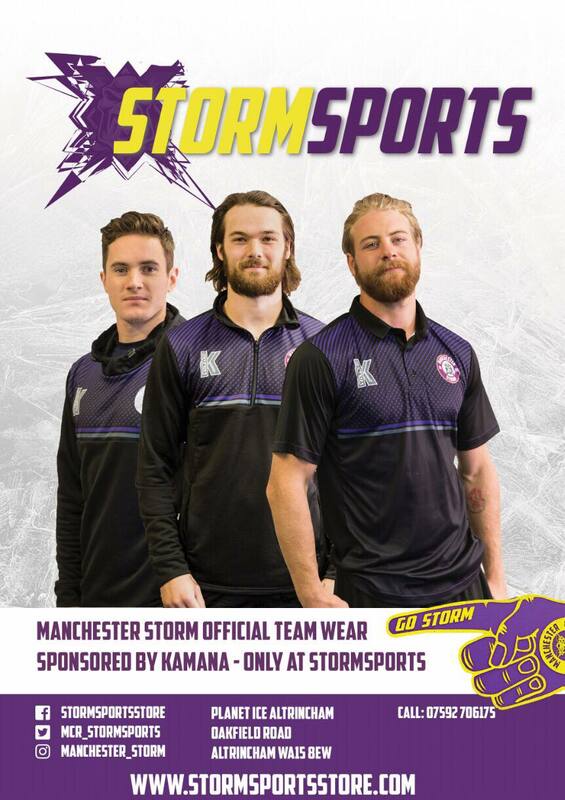 Last night your Go Goodwins Manchester Storm played their final game of the 2018/19 season. 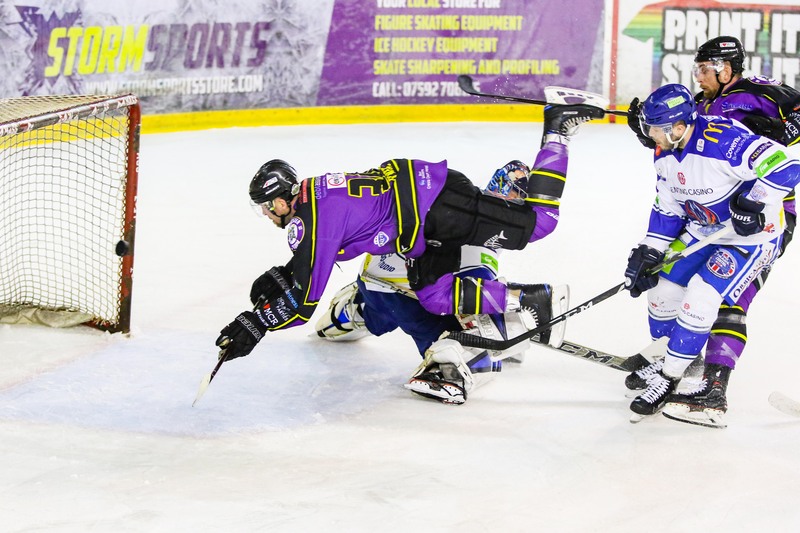 It was a fight between themselves and visitors Coventry Blaze, to secure a Playoff position. 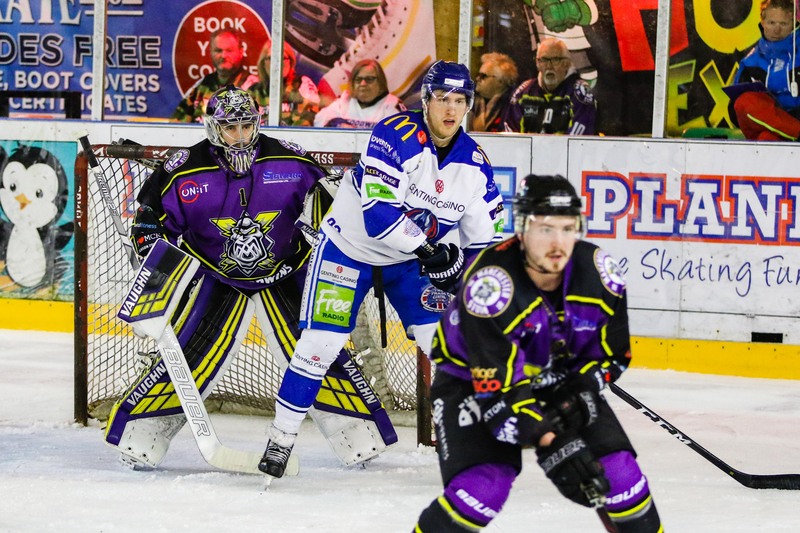 Returning from a win in Milton Keynes the night before, Storm were just one point above the Blaze and last night was the decider on who would clinch Playoffs. The Blaze drew first blood just three minutes into play, scored by Crowder through the five-hole of Ginn, assisted by Lake and Pauly. They had a further opportunity when Storm’s Linsmayer was sent in the penalty box for high-sticking at 4:50, but were kept out, Storm holding up a strong penalty kill. Forbes was handed a two minute penalty for slashing at 8:40, but the Storm were unable to get one past Hackett. 11:00 into play, Bakker received a penalty for tripping, giving the Blaze the upper hand. Ferrara found goal number two for the Blaze on the powerplay 45 seconds later, assisted by Lake and Hackett. With Stadel in the box for slashing at 13:09 and Crowder for hooking at 13:36, there were still plenty of chances for both sides. It was Moffatt who found Storm’s goal, deking the puck past Hackett, assisted by Poulin and Ruopp at 14:57. In 20 minutes that was mostly end to end hockey, the second period only saw one goal and one penalty. Blaze seized an opportunity early on into play, a top-shelf goal scored by Pauly, assisted by Crowder and Bryhnisveen at 23:44. Bryhnisveen was given a penalty moments later for slashing 24:27, but held up a strong penalty kill, clearing the puck any moment they could. The buzzer sounded, the scoreline sitting in Blaze’s lead, 3-1. The third period saw Storm fighting back, attempting to pull some goals back in hopes of claiming 8th place in the race to Playoffs. Joyaux was given a penalty for for cross-checking at 50:15. Ginn was pulled for an extra player in the final few minutes of play. Despite any attempts of a Storm goal, it was Morris found goal number four for the Blaze, sending the puck into an empty net, assisted by Lawrence at 57:44. At 57:59, Crowder was sent to the box for delay of game. 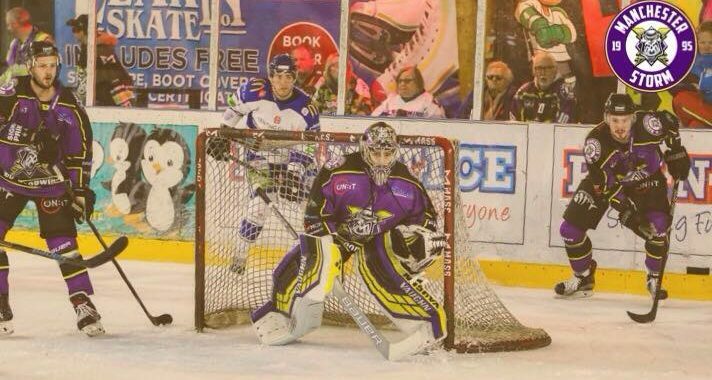 However, the Storm were unable to pull any goals back on the powerplay in the final minutes. The final buzzer left the result at 4-1 to Blaze, who clinched the playoff position, and will be due to play either Cardiff Devils or Belfast Giants. Man of the Match for Coventry Blaze went to #37 Matt Hackett. Man of the Match for Manchester Storm went to #9 Luke Moffatt. Shots on Goal: Matt Hackett – 33. Shots on Goal: Matt Ginn – 32. Referees: Blake Copeland and Andrew Dalton.